La Gomera is the second smallest of the Canary Islands, found just off Africa’s west coast in the North Atlantic. The dramatic green valleys, quiet sandy beaches and picturesque towns make La Gomera an ideal peaceful retreat. One of the best attractions is the large number of hiking trails meandering up the ravines, with varying difficulties. The highest peak is Alto de Garajonay, reaching 1487m, and is amidst the Garajonay National Park, which is a UNESCO World Heritage Site. The park’s dense vegetation comprises mainly Laurisilva, a humid subtropical forest. Inside the woodland, you may come across some indigenous species such as the Gomeran lizard or skink. The mountainous landscape plays an important role in La Gomera’s culture. The locals have developed an ancient method of communication called ‘Silbo Gomero’, which involves whistling across the ravines. It can be heard two miles away and is even taught in the island’s schools. After a day of hiking, wander through the town of Agulo on the north coast to admire the colonial buildings, winding streets and stunning clifftop views. There is also a small, pretty church called ‘San Marco’, featuring a beautiful statue of Christ. For an insight into the island’s ecosystems, forestry and agriculture, then visit the Museo Etnografico in Hermigua. The Church of Santo Domingo is also worth seeing, a 16th Century chapel with an intricately carved ceiling. Playa de las Vueltas is the most wind sheltered beach and is perfect for families. It offers soft black sand, calm waters and a few relaxing bars. 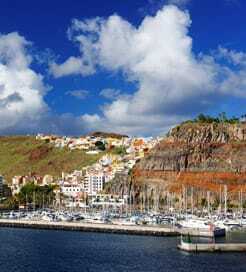 Getting to La Gomera by ferry is quick and easy, with the main port situated in San Sebastian on the east coast. There are a few sailings every day, departing from Los Cristianos in Tenerife. There are also daily crossings from La Palma which take a little longer. For more information, please visit our Ferries from Tenerife to La Gomera page. For more information, please visit our Ferries from La Palma to La Gomera page.